To purchase a print version of The Millionaire Fastlane, please visit any of the following venues, or special order from your local bookstore. Prices start at just $12.99. Or, TMF can be purchased/ordered from any bookstore. For orders outside of the USA, ordering via Amazon, Book Depository, or the publisher is recommended. To purchase a digital/eBook version of The Millionaire Fastlane, please visit any of the following choices. Prices start at $7.99. To purchase an audiobook version of The Millionaire Fastlane, please select any of the following choices. An audiobook preview can be heard here. Prices start at $34.99. 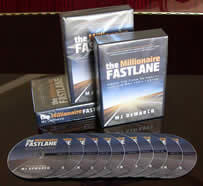 The Millionaire Fastlane has been published in multiple languages. More languages are on the way! For a language not listed, please visit our licensing page.